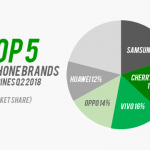 The top 5 smartphone brands in the Philippines for the first half of 2018 are Cherry Mobile, Samsung, Vivo, OPPO, and Huawei (in that order). This is according to the International Data Corporation or IDC, a respected global market research firm. These are the same brands that top a Q2 2018 ranking by Counterpoint Research although with different positions. Cherry Mobile remains the number one brand of smartphones in the Philippines. This is largely due to its affordable products. However, the company has been facing strong competition from Chinese brands with competitive pricing. Thankfully, the company has recently launched its new Cherry Mobile Flare S7 series of smartphones that will surely increase the brand’s sales. A standout smartphone from the company is the new Cherry Mobile Flare S7 Plus that is poised to compete with the midrange offerings of OPPO, Vivo and Huawei and a lower price tag. Samsung is the comfortable second placer. Its Galaxy J series has been doing well in the country due to the brand’s solid reputation and celebrity endorsements. The company recently unveiled the Samsung Galaxy A7 (2018) that boasts a triple rear camera system. Unsurprisingly, Vivo got the third spot. 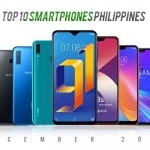 The Vivo Y71 has been one of the most popular smartphones in the Pinoy Techno Guide database. The company’s Y series is its sales driver but more consumers aspire for their V series including the Vivo V9 and the new Vivo V11. OPPO now occupies the fourth spot in the ranking. Vivo’s push for more sales has inadvertently affected OPPO. 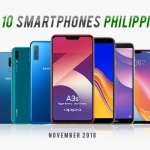 Nevertheless, OPPO now has better offerings including the OPPO A71k, a discounted smartphone sold in partnership with Smart. Finally, Huawei snags a place in the top 5 smartphone brands in the Philippines. The company’s feature-packed products, aggressive pricing, and increased presence have paid off. The Huawei Y6 2018 and the company’s Nova smartphones have been the biggest contributor to Huawei’s rise. 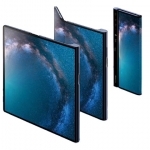 Its P20 smartphones have also strengthened the brand’s image as a tech innovator.